Inspector Fiona Lieutier is Tasmania’s longest serving female Inspector: graduating in February 1985 and promoted to the rank of Inspector in 2002. She says that when she joined there were very few women police officers and her family did not want her to join, but she felt she could protect people and make a difference. She recalls that policing posed many challenges for women when she was striving for promotion. 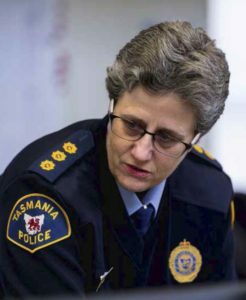 This page -- https://www.police.tas.gov.au/about-us/100-years-women-policing-tasmania-police/profiles/fiona-lieutier/ -- was last published on December 19, 2017 by the Department of Police, Fire and Emergency Management.